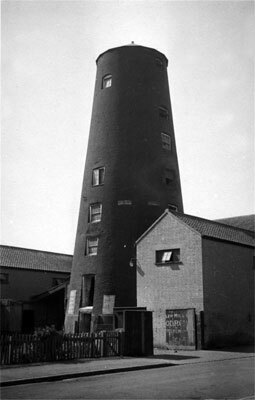 New Lakenham Peafield towermill had an 8 storey tower with a Norfolk boat shaped cap, a gallery and 4 double shuttered patent sails and a 6 bladed fantail. One pair of sails had 10 bays of 3 shutteres and the other pair had 11 pairs of 3 shutters. The 100ft sails were struck via a chain pole and drove three pairs of 4 ft. 6 ins. French burr stones, two flour mills and jumper. A stage was set around the second floor. The shot curb at the top of the tower had an independent ring of rollers between the cap and curb. 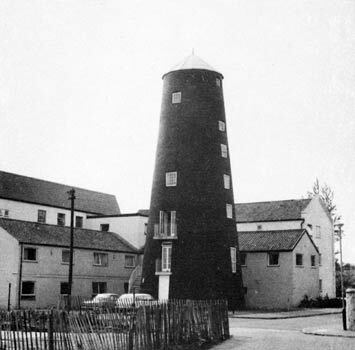 Peafield towermill in New Lakenham was also known as Spratts's Mill and The Black Mill at various times. As of 2005, this is the only surviving windmill in Norwich itself. Henry_Lock built it at a cost in excess of £2,000 in 1824, he also built and owned Lakenham_Bracondale_towermill and Poringland_towermill. The tower was reputed but unconfirmed to be 80 feet high, which would make it higher than Sutton mill. Thomas Spratt was the original miller. He may have employed Henry Spratt, who was bankrupt in 1828 and was petitioning for relief from bankruptcy in 1830, the mill being marked on that year's map. Henry Spratt, formerly of Tharston, near Long Stratton, Norfolk, Miller, then of Norwich, Baker, then of the Hamlet of Lakenham in the County of the said City, Miller and Baker, then of Chapel Field Row, Norwich, Baker, and then of Norwich unemployed, Bankrupt. The Court for the relief of Insolvent Debtors. THE Matters of the Petitions and Schedules of the Prisoners hereinafter named (the same having been filed in the Court) are appointed to be heard as follows:- At the Court House, at the city of Norwich, on the twenty-second day of March, 1830, at Ten o'clock in the Morning precisely HENRY SPRATT, formerly of Tharston (near Long Stratton) in the county of Norfolk, Miller, then of the parish of Saint George of Colegate, in the city of Norwich, Baker, afterwards of the parish of Saint Mary, in the same city, then of the hamlet of Lakenham, in the county of the said City, Miller and Baker, then of Chapel Field Row, in the said city, Baker, and late of Mill-street, Crook’s Place, in the hamlet of Heigham, in the county of the said city, unemployed. 9, Cook’s Court, Lincoln’s Inn, London. Thomas Spratt was the youngest child of John and Sarah Spratt and brother of Henry Spratt of Tharston mill. Thomas was baptised on the 6th October 1799 at Shotesham St. Mary. At one point Thomas also ran the watermill and towermill at Tharston, the latter being described as “new-built” in 1827. Thomas Spratt left Lakenham Peafield mill in 1833. He was married on 29th November 1825 to Mary Westgate at Shelton. Thomas died in 1881 in the Norwich Union Work House after years travelling around the country as a coach maker. On Monday, March 25th, 1833. ALL the HOUSEHOLD FURNITURE, Stock in Trade, and other Effects of Mr. THOMAS SPRATT, Miller, Peafield, in the hamlet of Lakenham, Norwich. The stock, &c. consist of 5 sacks of flour, 12 sacks of sharps, 13 score of pollard, two coombs of peas, barley meal, 380 capital flour sacks, 20 flour cloths, sack barrow, shovels, two bushel measures, set of ditto, crow bar, flour tins, corn sieve, meal trough, writing desk, flour bin, two grindstones, ladder, wood, splittles, quantity of carpenter’s tools, deal boards, scantling, two old cylinders, carpenters bench, three gates, rack and manger, door and jambs. deal partitions, long ladder, water tubs, two chickens’ coops, wheelbarrow, pair of wheels, donkey harness, fork and shovels, two pigs’ sties, pair of steel springs, blocks, corn bin, sundry old iron, &c. &c.
Sale to commence at Eleven o’clock. A Capital Brick Tower WINDMILL, with Winding Tackle and Patent Sails, driving three pair of French Stones; two Flour Mills and jumper, with all necessary Machinery & Fittings for carrying on an extensive Flour Trade, situated at the Pea Field, at Lakenham, near Norwich, amidst a large Population, where many advantages are combined. For Particulars apply to Messrs. Francis, Turner and West, Solicitors; or to Mr. Henry_Lock, Millwright, King Street, Norwich, who will shew the Premises. Henry_Lock of Bracondale, Millwright, Builder & Engineer, Dealer & Chapman. Charles Clare was the next miller. He was born c.1801 at Little London, Norfolk. The mill was marked on the 1834 and 1838 maps. Charles Clare left in 1838 to take Bixley towermill. Charles Clare was followed by James Faulke who was born c.1794 at Happisburgh. In 1841 he was given as a miller aged (40-44) living in St. Stephen’s Road, St. Stephen’s with his wife Rebecca, (40-44), and sons James, 20-24, a miller and Robert, (20-24). He was listed in Blyth’s Directory of 1842 as being at the Tower mill, Peafield, with a home address in St. Stephen’s Gates. He was at the mill until 1845 and in 1851 was given as a proprietor of houses living at 25 Victoria Street, Lakenham with his wife Rebecca, (53), and son Robert, (28). WITH patent sails, driving three pairs of stones; also stables, cart lodge, and about 60 rods of Land, in the occupation of Mr. Falke. The mill has 9 floors, was erected about 20 years since, at a cost of upwards of £2000, and has recently, with the machinery, been put into complete repair. In the Norwich Union Life Insurance Office, for £500 on the life of Mr. Thomas Spratt, late of Mulbarton, miller, now in the 46th year of his age. – The policy is dated 20th January 1834, and carries bonuses to the amount of £29. 13s. 4d. Annual premium, payable in January, £11. 8s. 4d. For Particulars and Conditions of Sale, apply to Mr. Edward Field, Solicitor, St. Stephen’s, or to the Auctioneer, Theatre Street, Norwich. In 1845, Isaac Hardy was described as miller at Peafield during the trial of his cousin William Hardy, manager of Saxlingham Thorpe towermill who was eventually convicted of stealing wheat from his employer. It is likely that Isaac Hardy was an employee. A Flour Wind, Steam or Small Water Mill. Apply to James Faulke, Victoria Street, St. Stephens, Norwich. 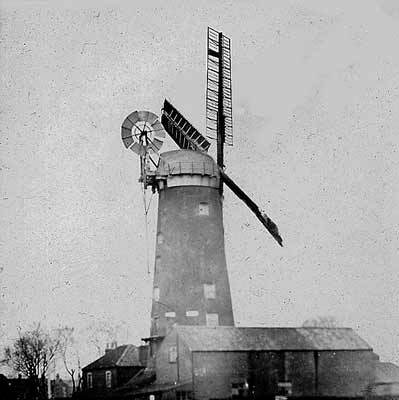 The mill was bought by Barnabas Feltham who had moved from Saxlingham_Nethergate_towermill and was worked by his sons Jonathon and Mark, who were listed in hunt and Co.’s directory of 1850 as millers at Lakenham. Barnabas Feltham was born c.1791 at Fundenhall, Norfolk and in 1851 was given as a farmer of 40 acres employing 2 men at Saxlingham Nethergate. Jonathon Feltham was born c.1821 at Saxlingham Nethergate. He went to Brooke_postmill and then to Loddon_watermill by 1851, where he ran both the watermill on the River Chet and the towermill nearby. He died in July 1878. Mark Feltham was born c.1824 at Saxlingham Nethergate. In 1851 he was given as a miller and merchant aged 27 living at 2, Mill Yard, Lakenham with his wife Hannah (28), son Randall (4) daughter Agnes (3) and son William (10 mnths), He was listed in White’s Directory of 1854 as a miller at Peafield. Barnabas Feltham died in 1855 and the mill was put up for auction in July of that year. and Four Cottages, situate in Crook’s Place. HAVE received instructions from the Executors of the late Mr. BARNABAS FELTHAM, to SELL by AUCTION, on Thursday, July 19th, at Six o'clock in the Evening, at the Norfolk Hotel, the following Property, situate in the City of Norwich. Lot 1. – A Brick Tower WINDMILL, (formerly known as Spratt’s Mill,) with four patent sails, drives three pairs of 4ft. 6in. stones, two flour mills and jumper; also a stable cart-house and piggery adjoining. – The Mill is occupied by Mr. Mark Feltham, stand well for wind, in a very populous district, near the Victoria Railway Station, and possession may be had at Michaelmas. Lot 2. – Four Cottages, situate opposite the John Bull public-house, in Crook’s Place, occupied by Oldman, Harmer, Poll, and Browne. Particulars and Conditions of Sale may be had of Messrs. Brightwell and Son, Solicitors, Norwich, and of the Auctioneers, Norwich and Yarmouth. 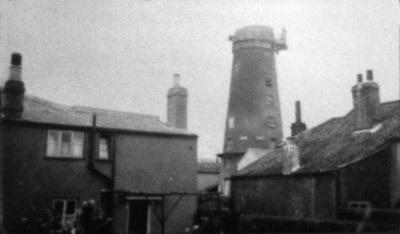 ALL that capital Brick TOWER WINDMILL, situate at Lakenham, near the Victoria Railway Station, and formerly known as “Spratt’s Mill,” with four patent sails and driving three pairs of 4 feet 6 inch stones, two flour mills, and a jumper; with a stable cart-house, and piggery adjoining, now in the occupation of Mr. Mark Feltham. Also two newly-built Dwelling-houses, adjoining the mill, with gardens, each house containing a parlour, kitchen, wash-house, and three sleeping-rooms. For further particulars apply to Messrs. Brightwell and Son, Surrey-street, Norwich, or to John Feltham, of Saxlingham. The mill was not sold and was put up for auction in March 1856. ALL that capital Brick Tower Windmill, situate in Lakenham, formerly known as “Spratt’s Mill,” with four patent sails, driving three pairs of 4ft. 6in. stones, two flour mills, and jumper. Also, a stable, carthouse, and piggery adjoining. And two new-built Dwelling-houses, adjoining the mill, with gardens, each house containing a parlour, kitchen, wash-house, and three sleeping-rooms. This Mill, which will be sold without reserve, was erected by Mr. Spratt at a cost, exclusive of the houses, of Two Thousand Pounds, and stands well for wind, and in a very populous district near the Victoria Railway Station. Possession may be had immediately. For Particulars and Conditions of Sale apply to Brightwell & Son, Solicitors, Surrey-street, and to the Auctioneers, St. Giles’ Street, Norwich. Barnabas Feltham jnr. took over the mill, having previously been running a tower mill in Saxlingham Nethergate. He was born in Saxlingham Nethergate c.1819. Mark Feltham went to West_Winch_towermill in February 1859 but he went bankrupt in August 1861. In 1861 Barnabas Feltham jnr. was given as a miller aged 46, employing 2 men, living at The Black Mill, Lakenham with his wife Elizabeth (37), son Samuel (7) and daughter Harriet (15). Barnabas Feltham junior’s youngest daughter Elizabeth died on the 29 th January 1864. Barnabas Feltham jnr. appeared in Court in November 1856, charged with having deficient weights. Before the MAYOR, W. J. UTTEN BROWNE, J. SULTZER, R. CHAMBERLIN, T. BRIGHTWELL and J. BETTS, Esqs. Barnabas Felton, of Lakenham, miller, was charged with having in his possession two deficient weights and two unstamped weights. – Mr. Mendham prosecuted and Mr. Chittock defended. – The charge was proved, but not being of a very serious nature, the defendant was only fined 10s. and costs. WANTED, a Young Man to assist in a Mill and to drive a Cart. Apply to New Lakenham Mill, Norwich. WANTED, a Young Man to Drive a CART and ASSIST in a Mill. Apply Mr. Feltham, New Lakenham Mill, Norwich. WANTED, a Young Man as CARTER and to make himself generally useful in a Mill. Apply B. Feltham, New Lakenham Mill, Norwich. FELTHAM. – On the 7th inst., very suddenly, Mr. Jonathan Feltham, of Sisland, for many years a merchant and miller at Loddon, aged 58. 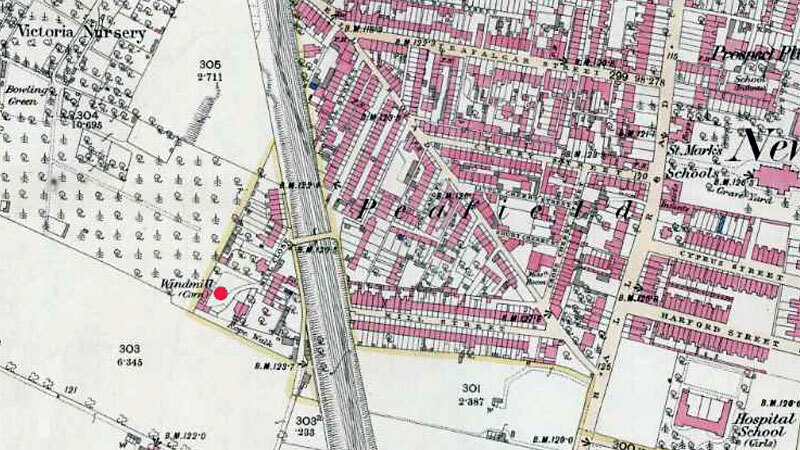 The mill was marked on the 1874 map. Barnabas Feltham was listed in Hamilton’s Directory of 1879 as a miller at the Tower Mill, New Lakenham. In 1881, he was given as living at Mill Close, Lakenham with his wife Elizabeth (58) and children Harriet (37) and Samuel (27). He was listed in Eyre’s Directory of 1883 as a miller in Mill Close, Lakenham. 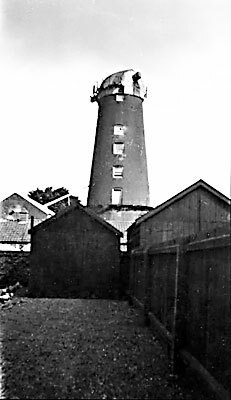 The mill was marked on the 1884 map and was damaged in a gale on the 26th January 1884. Barnabas Feltham jnr. was listed in White’s Directory of 1886 as a miller at Mill Close, Lakenham. He died on the 25th March 1888. Mr. B. Feltham, a miller, living in Mill Close, Lakenham, and who has carried on business for upwards of 30 years, died very suddenly on Sunday night. He had been seized with violent pains during the afternoon, but after receiving medical attention he became better. When he had retired to his room at night, a noise of a fall was heard, and his son and daughter found their father lying dead on the floor. Messrs Fiddy and Smith then took over the mill. Robert W. Fiddy had been at Keswick_watermill in 1883. Mark Smith was born c.1853 in Newton Flotman and in 1881 he was given as a miller aged 28 living at 13 Long Row, Lakenham with his wife Emma (27), son Mark (3m) and daughter Anna (4). Robert Fiddy was born c.1858 in Eaton. In 1881 he was given as a corn merchant aged 23 living in Swan Yard, St. Peter’s St., St. Peter’s Mancroft with his wife Laura (21). In 1882 a daughter, Mildred was born, in 1883 a son, Cecil Claude was born, in 1885 a daughter, Olive Laura was born and in 1889 a daughter, Nellie Violet was born. In 1891 Robert W. Fiddy was given as a farm merchant aged 35 living in St. Peter St., St. Peter Mancroft with his wife Laura (31), son Cecil (7) and daughters Mildred (9), Olive (6) and Nellie (2). Robert W. Fiddy was listed in Kelly’s Directory of 1892 as living at 101 Trinity St., Norwich. Later, Robert W. Fiddy ran the mill on his own until 1905, when the mill was put up for auction. Sale of valuable Trade Properties and a Suburban Residence. Also two Valuable Life Policies. S. MEALING MILLS is instructed to Sell by Auction at the Royal Hotel, Norwich, on Friday September 8 th, 1905, at 7 pm. precisely in Seven Lots. WIND AND STEAM GRIST MILL with GRANARY, WAREHOUSES, LARGE STABLING, TWO DWELLING HOUSES AND LEASEHOLD LAND adjoining, situate at Eleanor Road, near Trafford Road, New Lakenham occupied by Mr. Fiddy, jun. Castle Meadow, Norwich } Vendor’s Solicitors. Cecil Claude Fiddy died on the 19th November 1908 aged 19, he was buried in the Rosary Cemetery, Norwich. Laura Fiddy also died in 1908, aged 48 and she was also buried in the Rosary Cemetery. Robert W. Fiddy died in 1920 aged 62 and was buried in the Rosary Cemetery, Norwich. Charles Edward Woodrow became the next owner of the mill, his father, Edward Woodrow having been tenant miller at Billingford_towermill, Scole_towermill and Horsford_towermill. He was listed in Jarrold’s Directory of 1911 as: - Peafield Mills, Wind and Steam Miller and Forage Merchant, Eleanor Road; 58, Angel Road, Roseberry Road, and 111, Barrack Street. He employed John Quantrill as miller until about 1914 when the mill was damaged by fire. 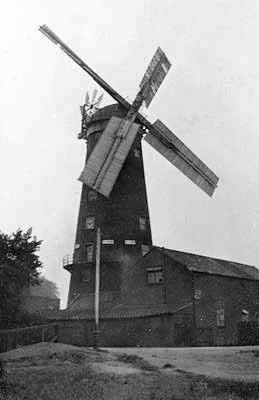 In 1914, Martins’, the Beccles millwrights, removed the sails. Charles Edward Woodrow was listed in Kelly’s Directory of 1916 as a miller, Eleanor Road, New Lakenham: corn & flour dealer, 4, Heigham Street & 58, Angel Road, New Catton. The mill was fitted out with electrically driver roller milling machinery in 1920, when Russell Quantrill was the miller. The cap was still on the mill in 1932, but it is thought that it was removed during the war. Milling continued until 1965 when C. E. Woodrow & Sons merged with R. J. Read Ltd. to become Read Woodrow Ltd. The mill was used as a grain store for a few more years and in 1970 it was acquired by Norwich Corporation and partly converted to living accommodation in the form of a one bedroomed flat. 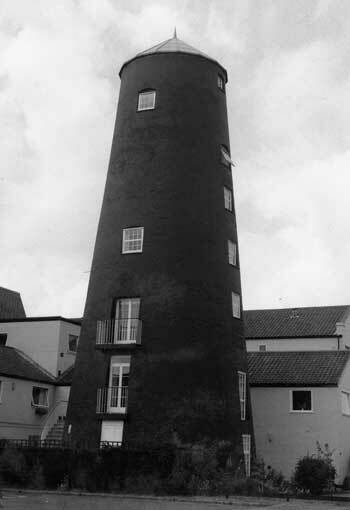 The mill was sold in 1990 and the rest of the tower, which still stood to its full height of 80’ to the curb as originally built, was then converted to residential accommodation. Has not had a cap on it since 1914 when together with the sails, it was removed. The mill is about 75 ft. tall without the cap. Inside are three pairs of 4 ft. 6 ins. stones. Mr. Russell Quantrill of Trafford Road and his father before him worked the mill. Milling equipment electrically driven, previously by steam. It ceased producing flour in 1870 and went in for the manufacture of animal foodstuffs until it was damaged by fire just before the First World War. Then for a time it was used to house German prisoners of war. It was in 1922 that Mr. Woodrow started milling flour again using one electric motor to drive the sails. He soon installed more motors and removed the sails. Production ceased when the Company moved their operations to King Street in the 1960s. Mill converted into a one-bedroom flat using 1st, 2nd and 3rd floors only. Four floors above not converted. Other mill buildings converted into 21 flats which have storage cupboards on the ground floor of the mill. Mr. Russell Quantrill, who died recently aged 78 was the oldest surving employee of C. E. Woodrow & Sons Ltd., of Power Roller Mills, Norwich. B. C. F. W. writes Mr. Quantrill was the son of the late John Quantrill who was employed as a miller when the mill was known as Peafield Mill before it was taken over by the late C. E. Woodrow in 1905. It was powered in those days by wind and sails. As miller, John Quantrill was responsible for the running of a steam engine, and the working and maintenance of three pairs of four-foot French burr stones for grinding wheat, barley and maize for the animal feeding trade. Later, high-speed steel grinders replaced the stones, and in 1920 a roller flour milling plant was installed with Russell Quantrill as general miller, a position he held until the flour milling side of the business was transferred in 1965 to the company's other mill at Stalham. After the merger of C. E. Woodrow & Sons Ltd. with R. J. Read Ltd. of City Flour Mills, Norwich in 1965, Mr. Quantrill continued as caretaker at Eleanor Road, until the premises were bought by the Norwich Corporation and converted into flats. Both the Quantrills, father and son, were skilled in the oold practice of stone dressing, an operation necessary for the consistent fine grinding of corn. This work, demanding experience, precision and skill, was done by hand using a heavy two-ended tempered steel tool known a s a "bill." It was a long and tiring operation. Mr. Quantrill, whjose home was at 88, Trafford Road, Norwich, died a widower, leaving one daughter. The one mill in Norfolk that was a constant during my childhood was the one in Eleanor Road,(off the Trafford Road near the old N and N hospital) which was barely 100 yards from my home and was producing flour all through the war. I vaguely remember its sails but they went in the 40s. The mill was a sheer delight for us children even though our presence was not encouraged! On my last visit to Norwich some years ago I found the buildings had all been turned into "luxury" flats - another treasured memory gone.